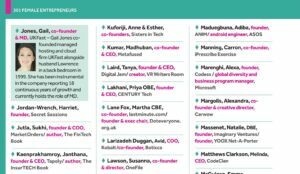 MarketOrders is thrilled to announce their co-founder and COO, Sukhi Jutla, has made the shortlist. Over the nomination period, WeAreTechWomen received over 500 nominations from across the UK and Northern Ireland. The calibre of entries for these awards was exceptional and all of the judges stated how difficult it was to arrive at the shortlist due to the amazing achievements of our nominees. Vanessa Vallely, Founder of WeAreTechWomen said, “At WeAreTechWomen we have made it our personal mission to shine a spotlight on women working in tech. Our strategic aim is to highlight 500 female future leaders in technology by 2022. The response to this year’s awards has been fantastic and calibre of entries has been outstanding! I am so proud to see so many women in tech recognised for their achievements and really look forward to seeing who our final winners will be in December. MarketOrders is thrilled to announce they are part of the #WeAreOneTech campaign to inspire more women and individuals from underrepresented communities to consider starting an ambitious startup. MarketOrders COO and co-founder, Sukhi Jutla, is one of 4 startup founder stories to be profiled for the launch of this nationwide campaign. OneTech is a ground-breaking new initiative, supported by the JPMorgan Chase Foundation, to provide female entrepreneurs, and those from some of London’s most underrepresented communities, with the opportunity to start and scale a high growth tech business. The lack of diversity costs the tech industry dearly in untapped potential, talent and growth. Capital Enterprise has long recognised that this needs to change. This project will connect founders with mentors and access a range of workspace, pre-acceleration, acceleration and investment readiness opportunities. We are aiming to get businesses to better understand why diversity and inclusion makes sense; what needs to be done to help diversify their recruitment and selection processes; and double the number of female and BAME (Black, Asian and Minority Ethnic) founders accessing investment by 2020. We hope to inspire more women and individuals from underrepresented communities to consider starting an ambitious startup, and affect real change with supply, demand and culture change in London’s booming tech ecosystem. On Oct 11 2018, MarketOrders attended a roundtable hosted by Business Cloud to discuss the impact of Brexit on the UK tech scene. The event hosted in the capital heard from the heads of fast-growing technology businesses, who remain defiantly optimistic in the face of Brexit uncertainty but admit that recruitment will be a challenge. Our COO, Sukhi Jutla, commented she was optimistic because entrepreneurs are pragmatic and have a ‘can-do’ attitude, they will adapt and survive. This sentiment was echoed by the other entrepreneurs in the room. London’s start-ups will find it more difficult to find and retain technology talent after Brexit – but tech leaders remain upbeat in the face of uncertainty. That was the general view from BusinessCloud’s latest roundtable discussion in the capital, which was held at KPMG’s offices in Canary Wharf and heard from a panel of experts and tech companies. Ben Corrigan is co-founder and chief revenue officer at shopping tool Pouch, which has a team of 11, with the majority being non-UK nationals. The entrepreneur insists that he remains optimistic providing that access to talent isn’t limited following the UK’s exit from the European Union. “If very talented tech people decide not to come to London because they fear that it’s too difficult then we’ll all be fighting over the same talent,” he said. Felicia Meyerowitz, CEO of Akoni Hub, admits there will be “a big bump” but is confident that the UK’s economy is “strong”. She says most of the clients she meets aren’t concerned and all have plans in place. “It’s been fascinating for me watching the play-out of the media and then going out to speaking to clients and asking them questions,” she said.